Softball season is over and my team totally rocked it! Second in state is not too shabby! At the end of every season we have a banquet to celebrate the season! I’m so lucky that I married a Matt, because I always have these crazy ambitious ideas that are a little difficult for me to execute. We bought Antique white satin spray paint, clear Matte spray paint, wide mouth ball mason jars and hemp at Walmart. Matt and I, spent hours on a Saturday painting these jars, you know how the project always takes longer than expected, well it did. I painted one whole jar until Matt told me he would help me, which means it was so bad that I needed his help. He coated the jar with the antique white spray paint, then I decided to let it dry. Then, I sanded the letters to give it the antique look. Next we painted the jars with the matte, a few of the jars were not dry all the way which caused the alligatoring on the jars. Then we let them dry for 48 hours and drew the seams on the jars with a sharpie. We tied the hemp on the jars and filled them with flowers, licorice and salt water taffy. These are adorable! 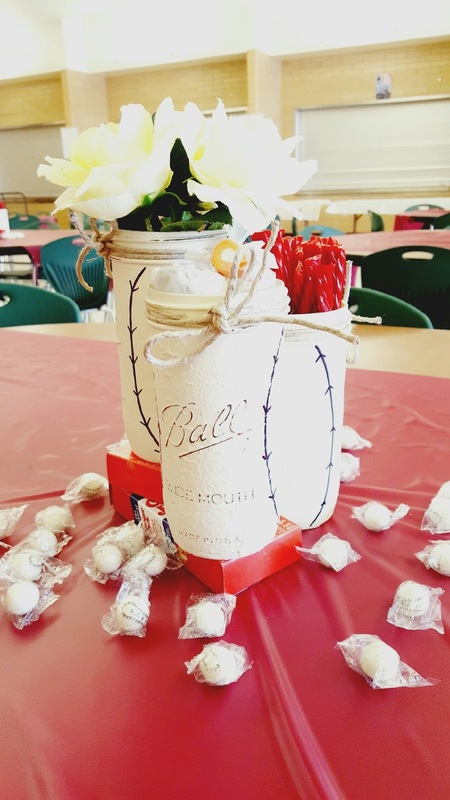 I just love anything with mason jars! I LOVE! Anything mason jar is a-ok in my book. There are a lot of repeat ideas I see, but this is the first time I've seen this one! Very cute! Oh goodness I am a nut for mason jars, these are so neat. Im pinning!!! Thank you so much for stopping by for Oh My Heartsie Girl ww to share!! This is so cool! Pinning and visiting form A Little Biridie Told Me LInk Party. Thanks for sharing such a cute idea! What a clever idea. You can't go wrong with mason jars and these are so different than most I have seen. These are so adorable! 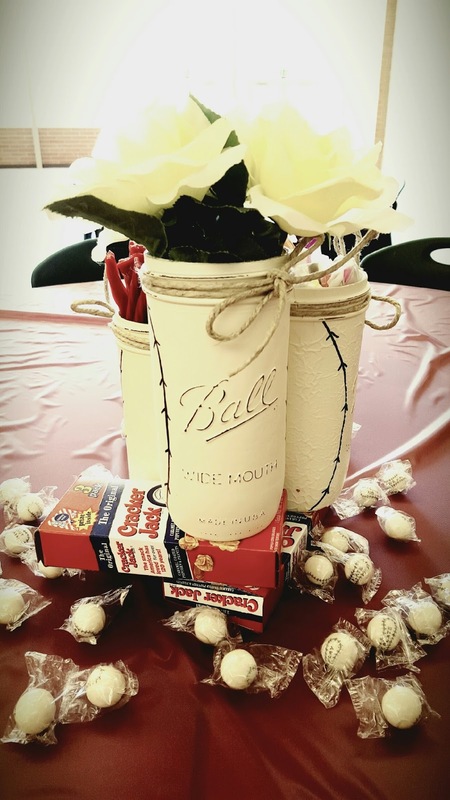 I just threw our youngest son a baseball themed party and these would have been perfect! I will definitely be making these in the future! How creative and cute! Thanks for linking up at #TurnItUpTuesday. Come by and visit my End of the Week Confessions Link-up. Always enjoy reading your posts! I love this! 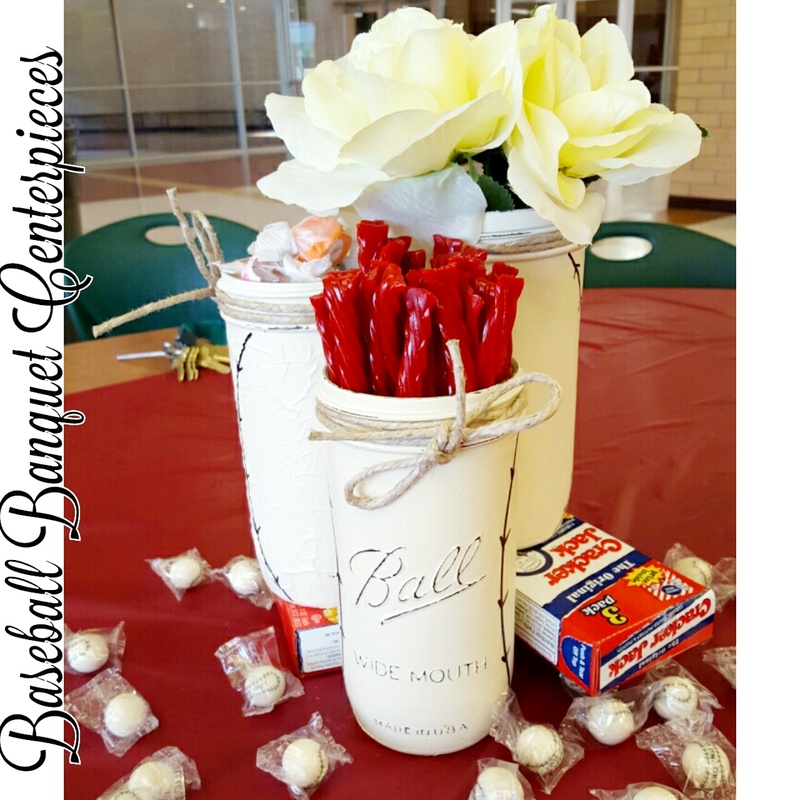 The jars work perfectly for a baseball theme table decoration. Thanks for sharing on Merry Monday. These are so adorable! Love the antique white spray paint too! Thanks for linking up with us at the Best of the Blogosphere!